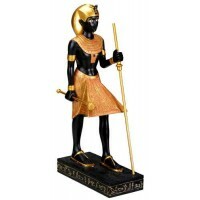 Statues such as this one were found in King Tuts Tomb to guard him. 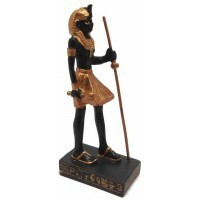 This black and gold resin statue is just under 12 inches tall. This cold cast resin statue in black and gold is 11 3/4 inches high. Item Number: PT-7718 | Approximate Size (Inches): 2.50 wide x 3.50 deep x 11.75 high | Approximate Shipping Weight: 2.00 lbs.